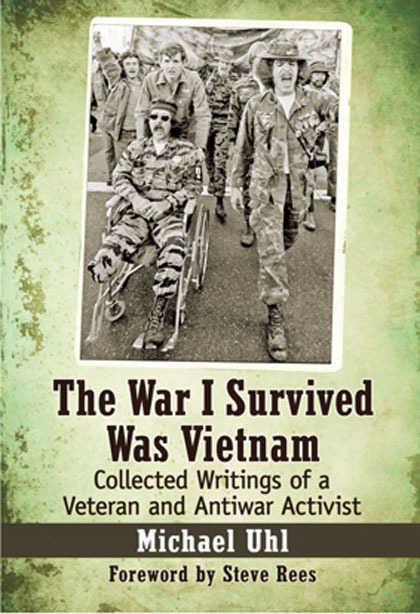 This entry is currently available in: The War I Survived Was Vietnam: Collected Writing of a Veteran and Antiwar Activist by Michael Uhl, available in paperback or e-book from Amazon and McFarland Publishers. “Michael Uhl was one of the most prominent figures in the veteran’s resistance movement that played a crucial role in bringing to the American people the shocking reality of the Vietnam war. This collection of his writings is a pleasure to read, and to contemplate.”—Noam Chomsky, Institute Professor Emeritus, MIT; “As one of the most eloquent voices of the Vietnam generation, Michael Uhl’s essays, journalism, and criticism provide an essential road map to ‘the defining predicament’ of his generation. Uhl masterfully explains and analyzes the literature, politics, and emotional realities of the Vietnam legacy. This is essential reading for those of us who are still trying to make sense of the Sixties.”—Clara Bingham, Witness to the Revolution: Radicals, Resisters, Vets, Hippies, and the Year America Lost its Mind and Found its Soul. The singular collection of articles, essays, poems, criticism and personal recollections by a Vietnam veteran documents the author’s reflections on the war, from his combat experiences to his exploration of American veteran identity to his struggles with PTSD. His career as an advocate for the welfare of GIs and veterans exposed to dangerous radiation and herbicides is covered. Several pieces deal with how the Vietnam experience is being archived by scholars for historical interpretation. These collected works serve as a study of how wars are remembered and written about by surviving veterans. As a political activist, Michael Uhl was co-founder of the Safe Return Amnesy Commttee and the GI and veteran advocacy organization, Citizen Soldier. He is a writer by trade. He is a writer and lecturer who lives in Walpole, Maine. He is also book critic whose articles and reviews have appeared in The Nation and The Boston Globe.